Taking Flight: Patient UPDATES! Our Bald Eagle Cage Underway! My goodness time has flown and gotten away on me. I have so many cases to update and things to tell. Let me get right to it! I am delighted to say that he is still with us. He continues to make slow progress. The key word here is progress. He has been a stellar patient and has the hearts of so many. Today for the first time, he was dismayed with me and showed it when I caught him up to bring him inside. 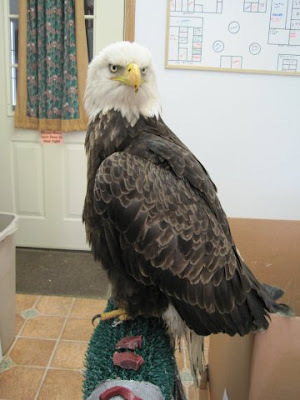 He spend most of the day out in a flight with another Bald Eagle in recovery. It was too cold tonight to leave him out. He is still in fragile condition, but he is less convinced of that that I am. His appetite is not been great. That is an additional concern. He has some heart problems, I think from the exhaustion of the three day trip down the Wisconsin River while wearing a muskrat trap on his foot. We will see if that resolves when he is completely recovered from his other medical problems. I am soaking his affected foot in hot water in the evening to quell the inflammation of the soft tissue. Soaking the foot of a Bald Eagle in a hot water bath is not an easy task. I am thrilled his condition is improving each day. I hate to get too optimistic, but so far so good. The best part is he seems at peace with his situation and is taking this captivity thing in stride. He is fascinated with us and what we are doing. He is an exceptional eagle, that seems to be keeping a mental log on humans. Some members of the Medford Bird Club were able to observe his enormous sense of self and calm during their tour on Saturday. It seems a contradiction at times that we are not able to share some of these cases in person with the public. 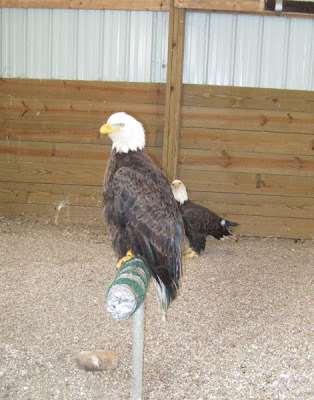 Our federal permits do not allow the general public to come into contact with the birds that will be released, unless it is incidental to care. The birds themself teach so much better than any human ever could. 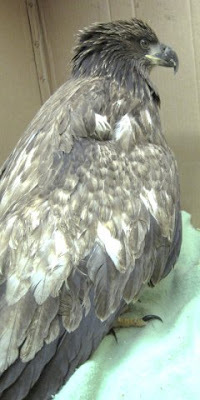 We have sad news about the immature Bald Eagle that was at first thought to be suffering from electrical shock injury. It turns out she was shot. Not only once for twice. Sadly despite our best efforts she died of her injuries. Not only did she have the broken bones from being shot, but her body was riddled with lead fragments from the bullets. She was a heart tugging case. Cases that involve purposeful acts of aggression against innocent and protedcted wild birds are the hardest for staff to deal with. It is illegal of course. I always wonder what goes on in the mind of people that are cruel to animals. It is a question I am quite certain I will not answer to in this lifetime. 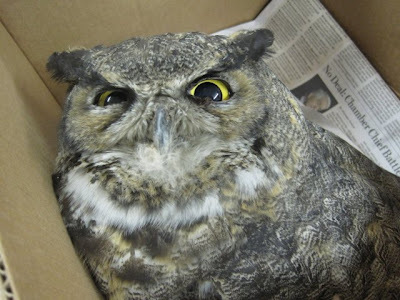 We also lost the Great-horned Owl that came in from Portage County. A young owl, he was accidentally poisoning while eating rats and mice at a waste treatment plant. I am always shocked by how many people actually believe the labels on some of these rodent poisons that proclaim not to harm other animals. Anytime you see the suffix "cide" after a word it means to kill. If another animal eats one that was poisoned they too will be poisoned in a sad cycle. Raptors are certainly not the "target species" in these cases. It is not done on purpose, but the result is the same. Amid the sadness of lost patients, we have some good news. We are beyond anxious to get our newest building project finished before the snow prevents construction. 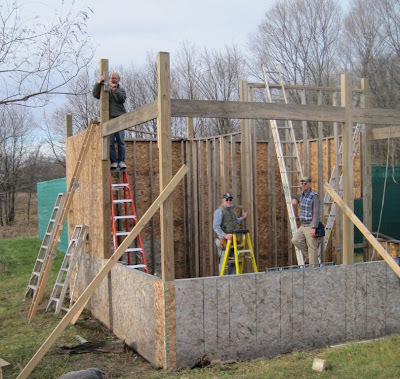 When Gary Witmann arrived a few weeks ago and volunteered to help with the project it was like a dream. I was pretty convinced I must have imagined the whole thing, when on Tuesday Gary along with two friends, Marvin Schmeiser and Steve Wagner arrived and set to work. It is true to say if you want something done ask a busy person. This group of friends actually just completed volunteering their time to build a Habit for Humanity home in Antigo. We are so very grateful.